Instead of relying on just one ingredient or superfood, Pro Vitamin Complete was created with the idea in mind of targeting most nutritional aspects in one complete supplement. 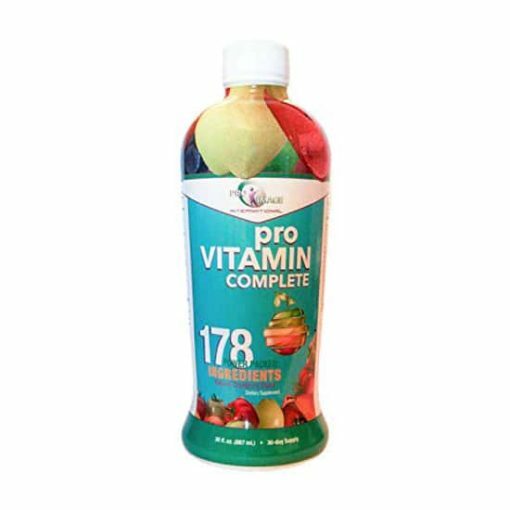 With 178 ingredients, Pro Vitamin Complete was designed to be the very foundation of your supplementation. It’s a well known fact that vitamins, minerals, enzymes and other nutrients work together synergistically for maximum benefit and health. Therefore it was very important to us that Pro Vitamin Complete cover as wide a spectrum of nutrition as possible. It was also essential that it be great-tasting and convenient to consume. With so many products on the market today boasting their formulas are the best, we believe Pro Vitamin Complete sets itself apart from the pack with the vast array of extremely bio-available, naturally occurring nutrients we pack into each serving. Before Pro Vitamin Complete I was taking vitamin capsules twice a day which were hard for me to swallow plus I had to remember to take them the second time. I love Pro Vitamin Complete, it tastes good and all I have to do is take it first thing in the morning and forget about it. With Pro Vitamin Complete I feel good and seem to have more energy. I got this product because we needed a vitamin that goes directly to the system. I’ve been taking it for a few weeks now and find that I do have more energy and this along with the ganoderma I feel is keeping us healthy and energetic. It also tastes really good which was very surprising. I even bought an extra bottle because I don’t want to run out. I highly recommend this vitamin.